A Raisin in the Sun examines the effects of racial prejudice on the fulfillment of an African-American family’s dreams. The play centers on the Youngers, a working-class family that lives in Chicago’s South Side during the mid-twentieth century. Shortly before the play begins, the head of the Younger family, Big Walter, dies, leaving the family to inherit a $10,000 life insurance payment. The family eagerly awaits the arrival of the insurance check, which has the potential to make the family’s long deferred dreams into reality. However, the members of the Younger family have conflicting ideas—conflicting dreams—regarding the best use for the money, which causes tension. At the beginning of the play Mama, Big Walter’s widow, expresses uncertainty regarding the best use for the money. Mama tells her daughter-in-law, Ruth, that she and her late husband shared the dream of owning a house, but that poverty and racism prevented them from fulfilling this dream during Big Walter’s lifetime. Mama’s daughter, Beneatha, aspires to attend medical school and become a doctor, a considerable challenge for an African-American woman at that time. Beneatha’s older brother, Walter Lee, belittles his sister’s dream, instead suggesting that she simply get married. Walter wants to use the insurance payment as an investment in a liquor store, an idea that Mama and his wife Ruth both dislike. Ruth, worried about her troubled marriage and the family’s cramped living situation, shares Mama’s hope for a house, although she is willing to support her husband’s dream because, as she tells Mama, “He needs this chance.” Walter finds his job as a white man’s chauffeur demeaning and he sees the liquor store investment as the only path towards a better future. On the same day that the check arrives, Ruth finds out that she is pregnant, which makes her question whether the family can afford to raise another child. Knowing that Ruth is considering an abortion, Mama begs Walter to convince his wife to keep the baby. Walter is unable to say anything and leaves the apartment. As Mama watches her family “falling apart,” she makes the decision to place a down payment on a home in the white neighborhood of Clybourne Park, hoping that her choice to “do something bigger” will bring the family together. Mama’s decision to purchase a house only sends Walter deeper into despair as he sees the opportunity to fulfill his dream disappear. On the other hand, the new house fills Ruth with joy and hope for her family, helping her to imagine the possibility of a happy future for her unborn child. Several weeks later, Walter continues to grow more despondent and skips work three days in a row. As Mama realizes that “I been doing to you what the rest of the world been doing to you,” she decides to transfer control of the household and the rest of the insurance money to Walter, asking only that he set aside a portion for Beneatha’s schooling. Mama’s decision reinvigorates Walter. A week later, the family is happily preparing for its move when Karl Lindner arrives and tells them of Clybourne Park’s offer to buy their new home as a way to dissuade the family from moving to the neighborhood. The family confidently refuses the offer. Moments later, Walter’s friend Bobo enters and tells Walter that Willy Harris has disappeared with the liquor store investment. Without heeding Mama’s advice, Walter had invested the entirety of the insurance money in the liquor store, and the loss leaves the family on the brink of financial ruin. An hour later, the Nigerian student Joseph Asagai visits Beneatha and finds her distraught over the lost money. Asagai asks Beneatha to marry him and “come home” to Africa with him, a sudden proposal that Beneatha says she will need to consider. Soon after, Walter informs the family that he will accept Lindner’s offer, which greatly disappoints them. However, as Walter and his son, Travis, face Lindner, Walter reclaims his dignity and refuses Lindner’s offer. Excited but well aware of the dangers that await them, the Youngers leave their apartment and head to their new home. Jumper, Alexandra. "A Raisin in the Sun Plot Summary." LitCharts. LitCharts LLC, 17 Oct 2013. Web. 25 Apr 2019. Jumper, Alexandra. "A Raisin in the Sun Plot Summary." LitCharts LLC, October 17, 2013. 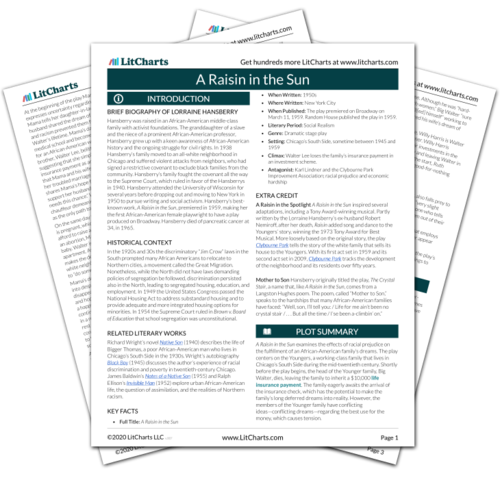 Retrieved April 25, 2019. https://www.litcharts.com/lit/a-raisin-in-the-sun/summary.